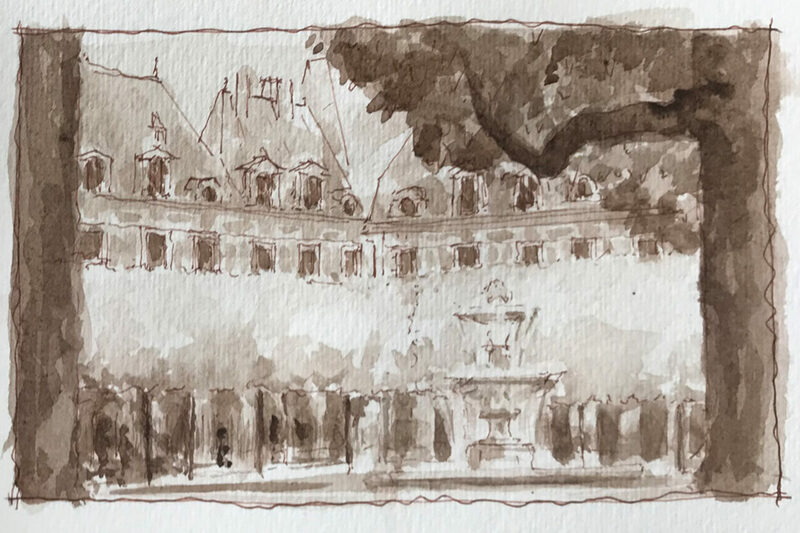 Follow the ICAA daily from October 3-13 as we study the classical architecture, interiors, and landscapes of Paris through observational drawing and painting. 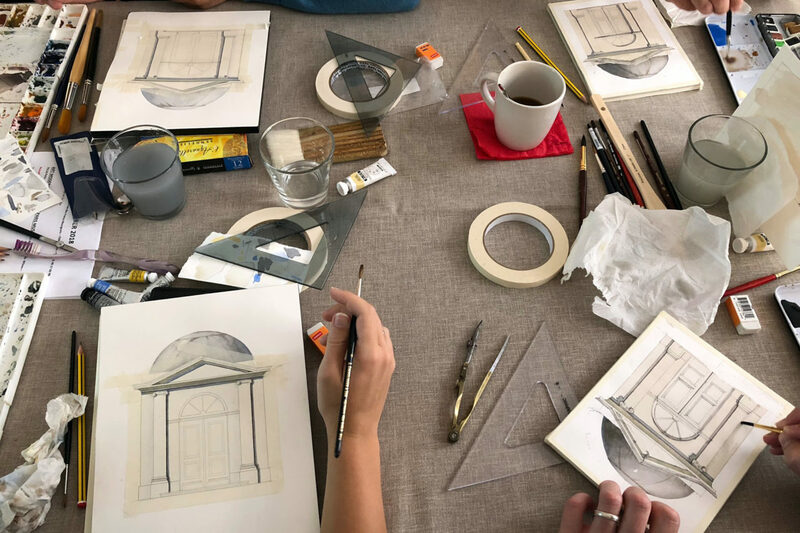 The program is led by prominent architect Kahlil Hamady and designer Leslie-jon Vickory, alongside renowned watercolorists, Bernd Dams and Andrew Zega. Daily blog posts are provided courtesy of Tour participants. As we conclude a week that feels like it has barely started, it was a day built upon many high points, which led to the inevitable warm embraces and good byes that signaled the next leg of our journey - the flight home. Continuing in the vein of the day before, we visited a masterwork of library design by Henri Labrouste, the Richelieu reading room at the Bibliothèque nationale de France. Getting inside is a rare treat because it still very much functions as the reading room of a research library. As such, you can't easily get access as a tourist. One would normally have to be doing approved research, so for us to get in as a group of artists, designers, and architects was indeed a special treat. As light streamed in around us from the oculi above, and the occupants studied with great aplomb, we were silently lead through the main room, and the main library stacks. The reading room was everything one could hope for and more. Gracefully arched iron trusses capped by shallow domes elevated the space, while murals of trees and foliage graced the upper limits of the room with vivid hues - imbuing the hall with naturalism before letting the eye meander among the sea of books that encompass the base. After passing through a caryatid archway we arrived in the reference stacks. With an air of industrial functionalism, the reference stacks felt as though you were at the intersection of a 19th century factory and a museum of curiosities - multi-story metal grated catwalks and storage shelves flanked both sides of the room. 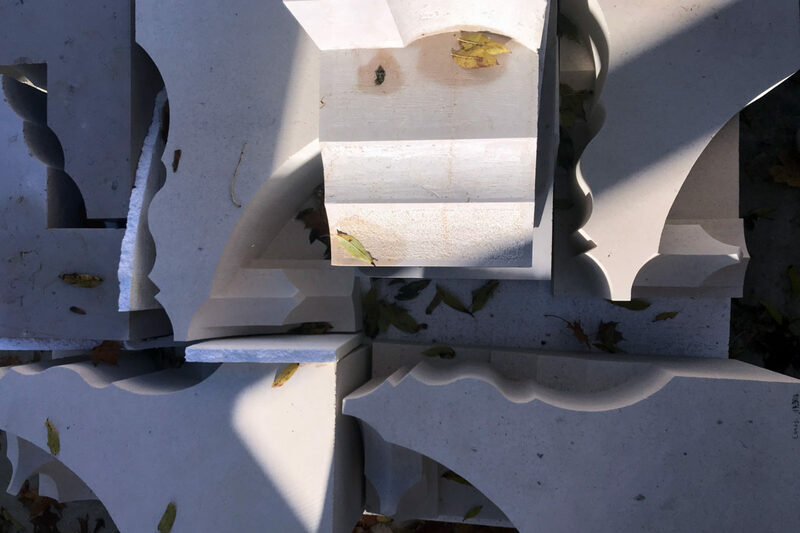 Upon close inspection, a subtle level of ornamentation revealed that they were built during an epoch where even the most banal and functional of things were not without thoughtful design, and even beauty. After we were given free reign of the afternoon, we all met at the studio of Andrew Zega and Bernd Dams for a farewell dinner. A cozy affair of fine table settings and open French doors - the atmosphere was such that no one really wanted to leave. After a brief cocktail hour we presented the culmination of our week's work for review by Andrew and Bernd, exchanged speeches and thanks, ate a heartfelt meal, and said our goodbyes. A truly warm and fitting way to end a week of drawing and travel. I think that I can speak for everyone when I say that it was an educational excursion that hit the mark. We spent the morning visiting the Bibliothèque Sainte Geneviève, the first building built in France intended to be a library. As we toured the building, a librarian told us of its history, ornament, and symbolism. The contrast between the outside and inside of the building is striking, with the outside being somber and intellectual, and the inside being more emotional and artistic. I also found the play of light and dark throughout the building to be particularly interesting. 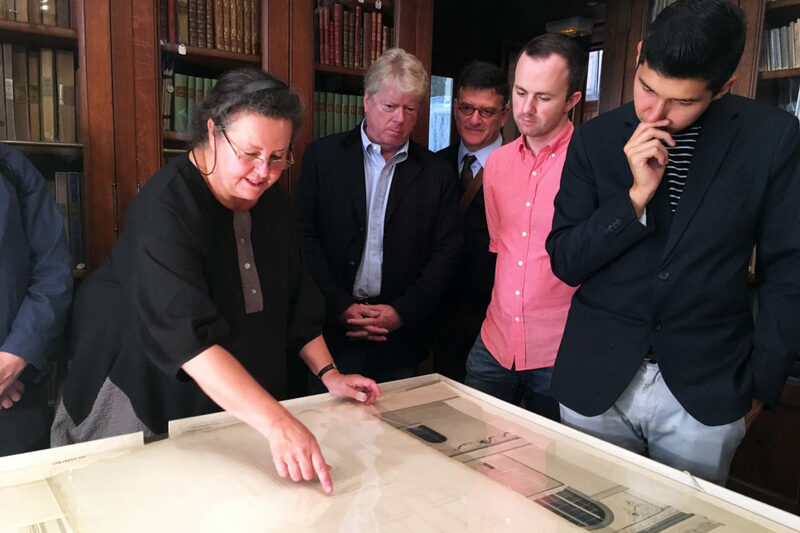 We then had the privilege of viewing several original drawings done by the building’s architect Henri Labrouste. 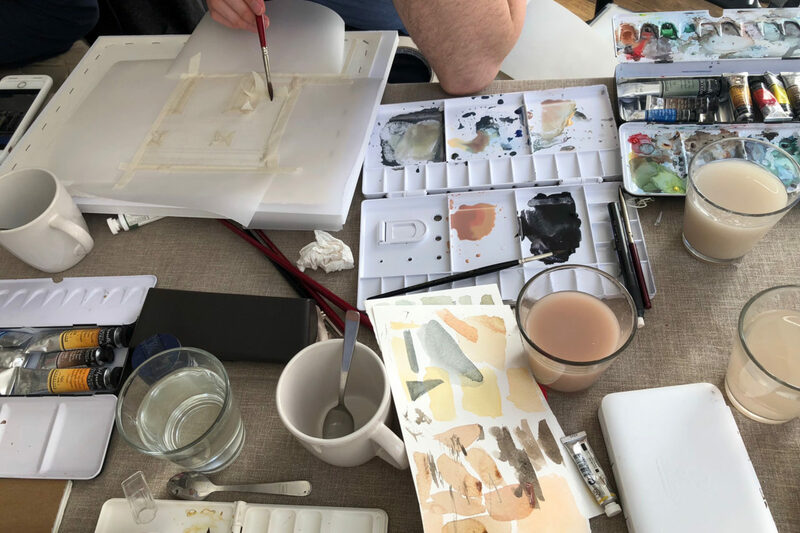 After a week spent learning about watercolor rendering ourselves, we were all captivated by the beautiful, precise drawings and the way they were so delicately rendered. Afterwards, we spent some time drawing the library’s reading room in the style of Hubert Robert. 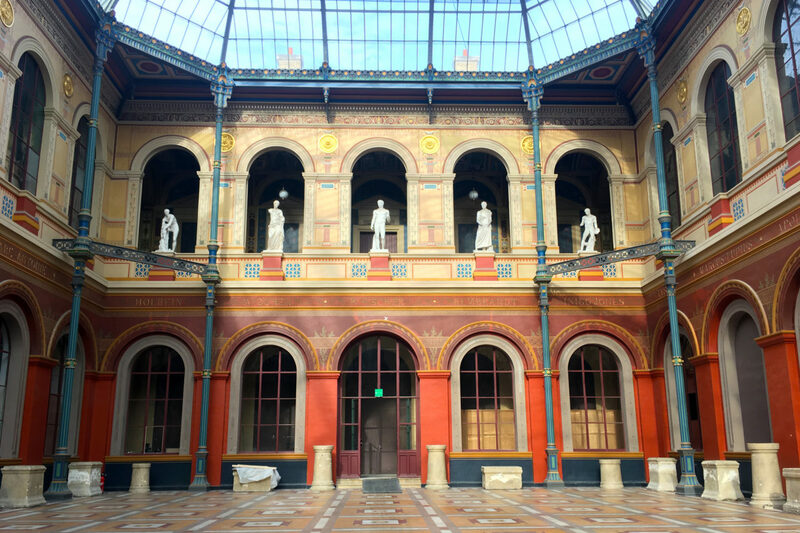 After lunch, we visited the École des Beaux-Arts, where several of the world’s greatest artists and architects have studied. We spent some time discussing the history of the school, including how it has changed throughout its hundreds of years of existence. 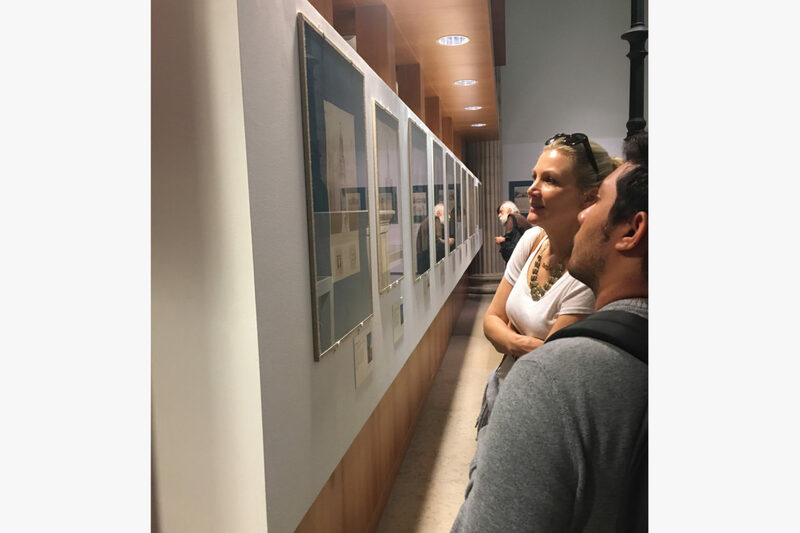 We had the rare opportunity to view drawings done by students studying classical architecture at the school in the 19th century. At the time, students would participate in a contest in which they were given an assignment and asked to create a proposal during a period of twelve hours. They presented their proposals using plan, section, and elevation drawings which they watercolored. We viewed an exhibition of some of the winning projects and were in awe of their beauty. 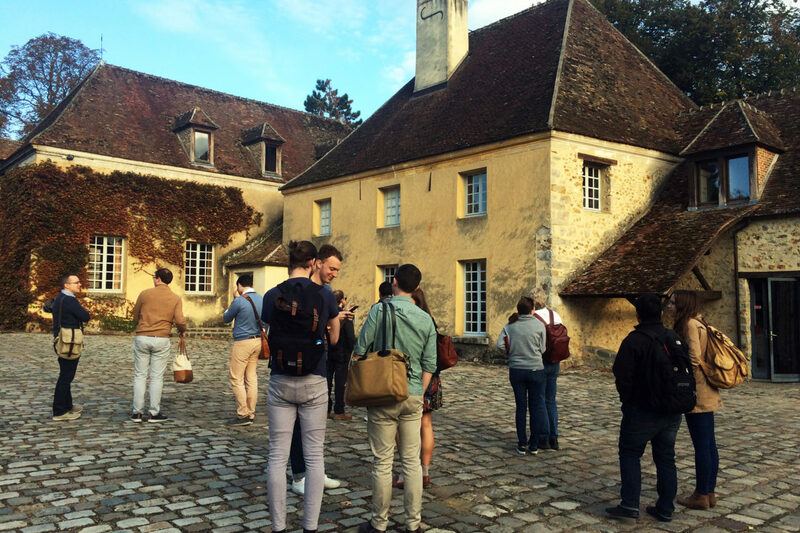 Thursday started with an early morning bus to the French countryside to Fondation de Coubertin, a French site dedicated to the training and work of young craftsmen. Traditional and classical craftsmanship are emphasized through various medium, including metalwork, masonry, and woodwork. 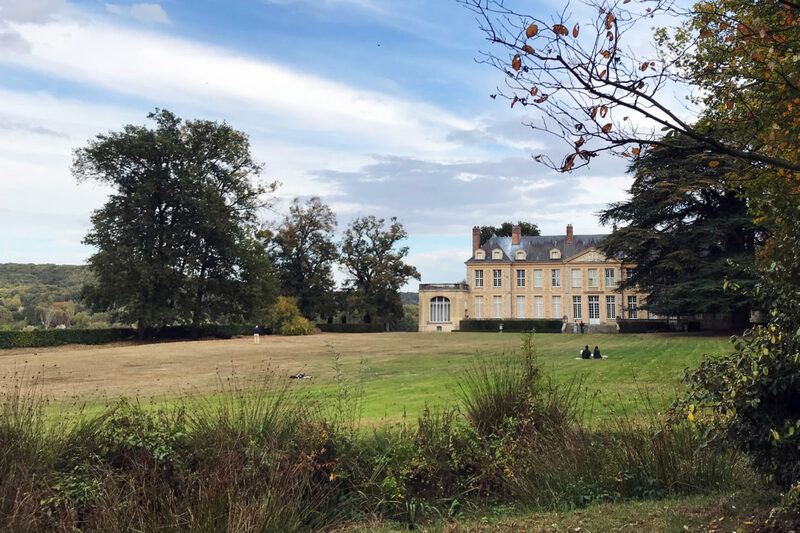 Fondation de Coubertin is devoted to its teaching through both classes and work, having the students alternate every two months between the two. The tour of the grounds allowed us to see examples of the stunning work and results of the craftsmen’s devotion to the work of hands. The craftsmen elevate the ideas of the architect; they are the makers. This passing along of knowledge through generations keeps the delicate craft alive and allows the craftsmen to create and restore the highest quality of work. We were also shown the raw materials throughout the site and how they used these materials to mold and craft extraordinary pieces and furniture. Along the tour we met a chief restorer of the Statue of Liberty who showed us his metal work and technique, along with detailed drawings. Lunch gave us the opportunity to meet two American students currently in the program at Fondation de Cobertin. 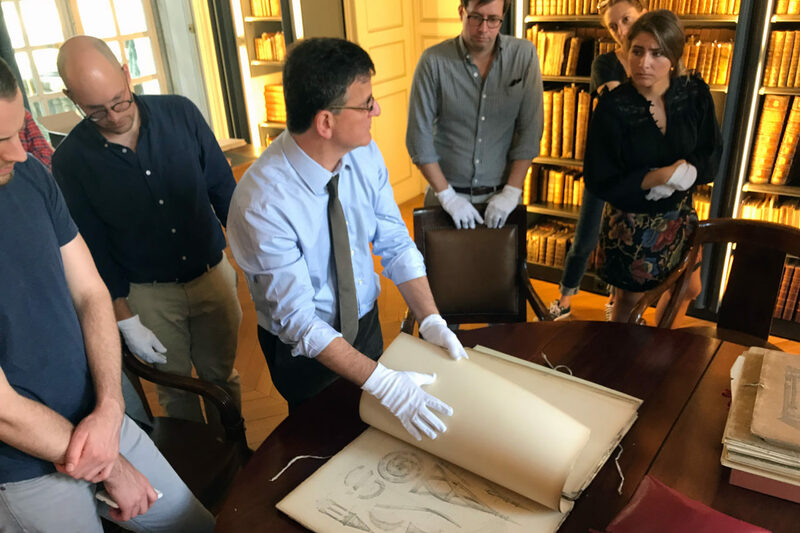 After lunch we visited the Château on the grounds and got to see an incredible library, full of historic books, including an original Vitruvius copy. 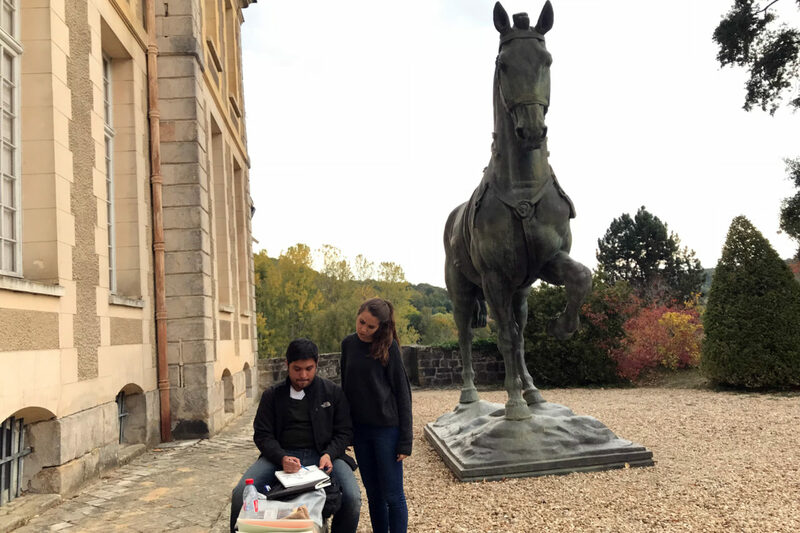 We concluded our day by sketching the Château and its surrounding grounds and gardens, before making our way back to the city center. 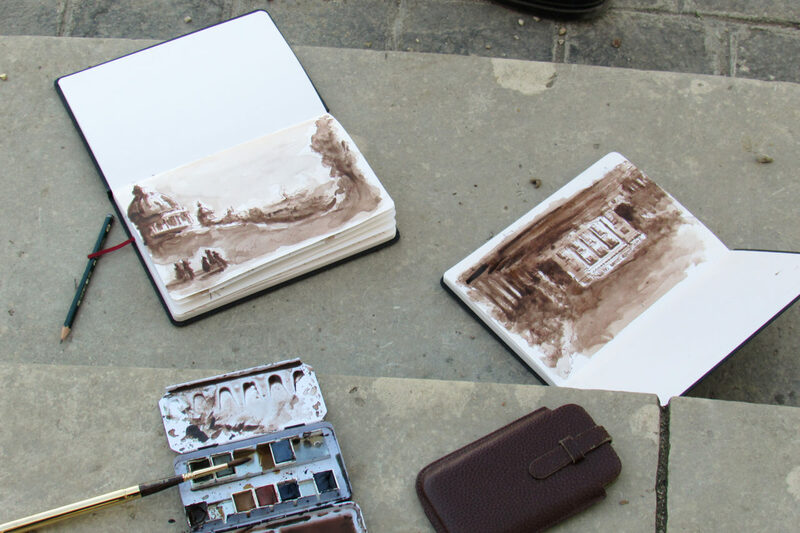 Today we accomplished two sessions of classical study - watercolor rendering and figure drawing. We arrived in the morning to coffee and pastries at the studio of instructors Andrew Zega and Bernd Dams. After everyone arrived, Andrew and Bernd described the publication process behind their works. We viewed their books as examples of different printing methods and also saw the many applications of their paintings. Andrew began class by continuing instruction on the pavilion drawing we started on Monday. 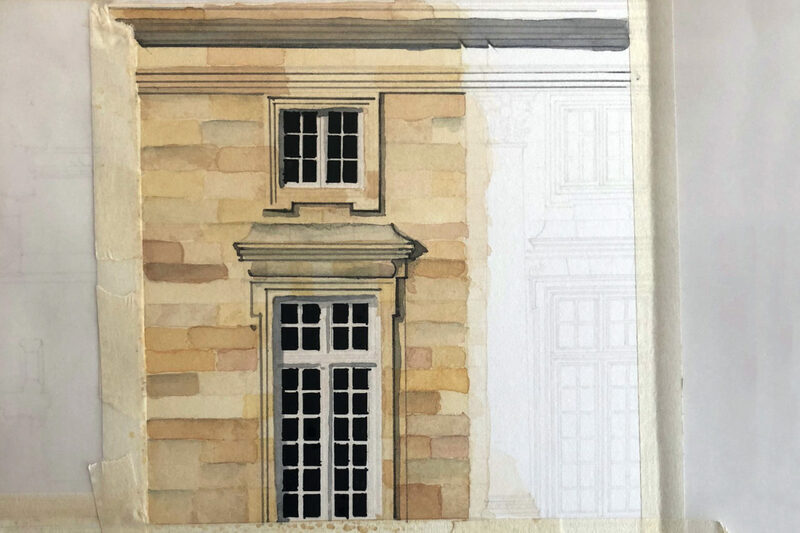 He taught us the importance of noticing the reflected light in a shadow and the process of making it glow with an added yellow or blue wash. After we finished instruction with the pavilions, we began a rendering of the facade of the Petit Trianon, which we studied yesterday. First we cached out the edge of the facade and then laid down our washes. What became most difficult was the process of swatching the colors of each stone. We all teetered on the line of too saturated or too diluted, but in the end neither was right or wrong. 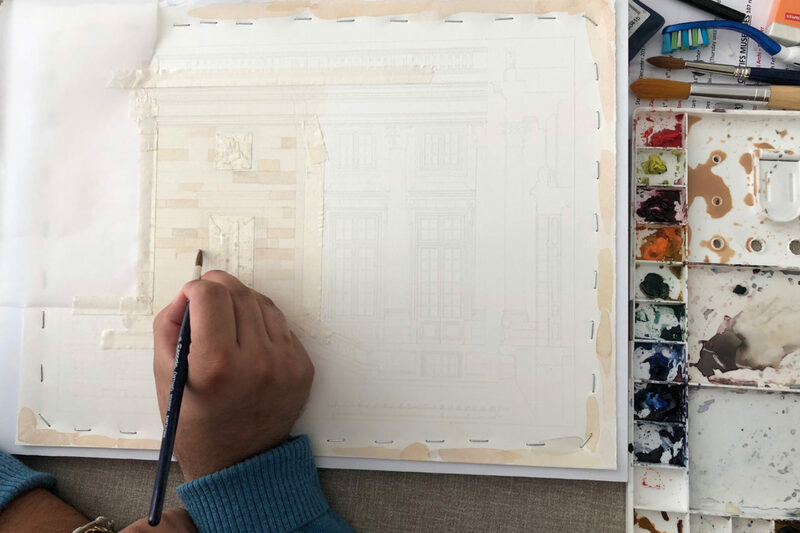 Watercolor is a medium that requires patience – we must wait for each layer to dry before laying down the next, and as we wait the watercolor improves. Through lessons with Andrew and Bernd we learned the importance of patience and also how rewarding that patience can be. 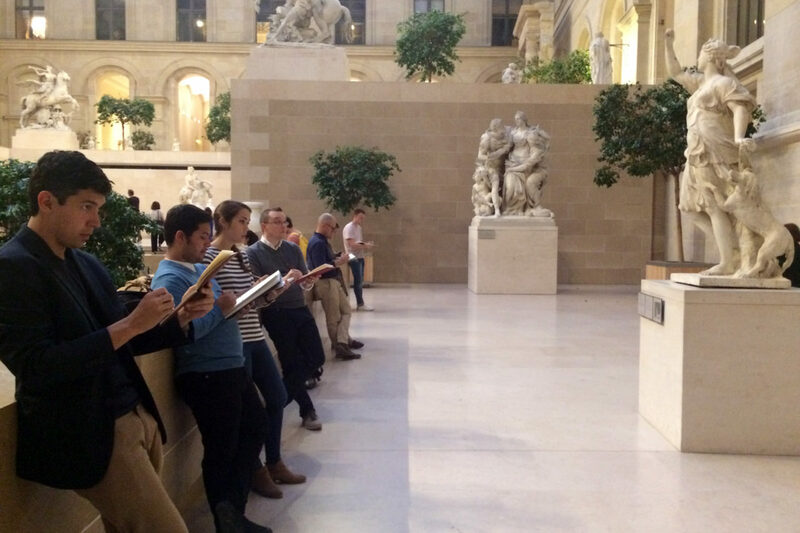 We proceeded into the evening with a sketching session in the Louvre Museum. Around 7:00 PM, we found ourselves amongst the statues, with Kahlil Hamady instructing us in the process of figure drawing by guiding us with our own sketches. He emphasized the importance of truly seeing the axis and the forms of the figure. We began with a statue of Diane that had a slightly active axis. While sketching we recognized the delicate angle in her shoulders and the volumes of her torso and pelvis that dictate the axis. After warming up with Diane, we moved to the other side of the display to sketch a statue of Venus. She was posed with her arm stretched high and the rest of her body twisting away. Venus was more difficult to capture, but the upgrade in challenge was enjoyable. 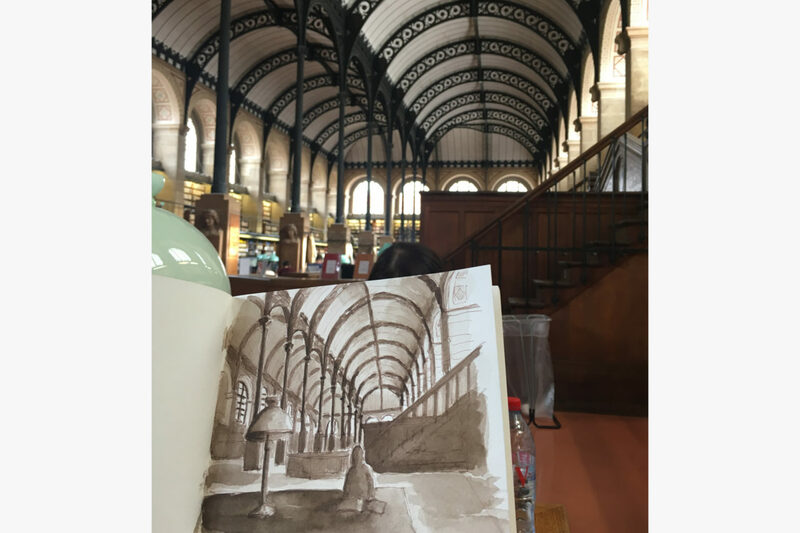 Sketching in the Louvre was an experience that we will never forget! Our day began by taking a trip from Paris to Versailles in the early morning. 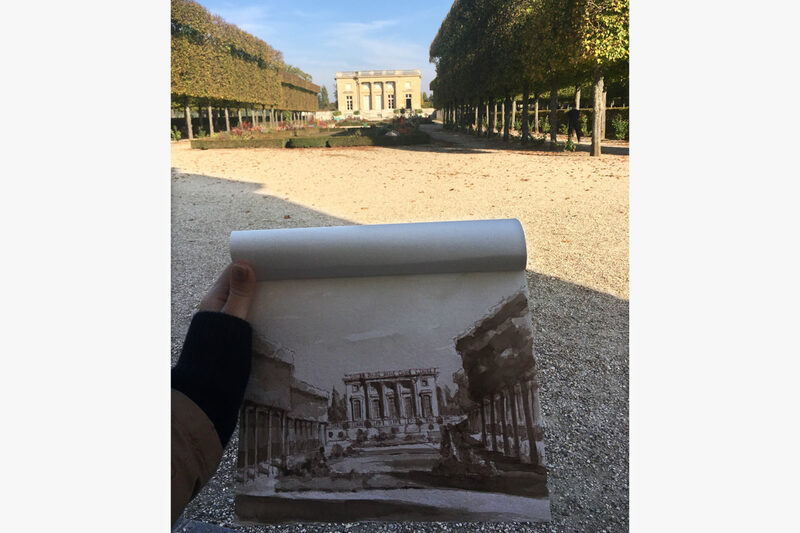 We arrived at the gates of the Grand Trianon where we were fortunate enough to learn that we would have the entire grounds of the Petit Trianon to ourselves for a private tour and drawing exercises. 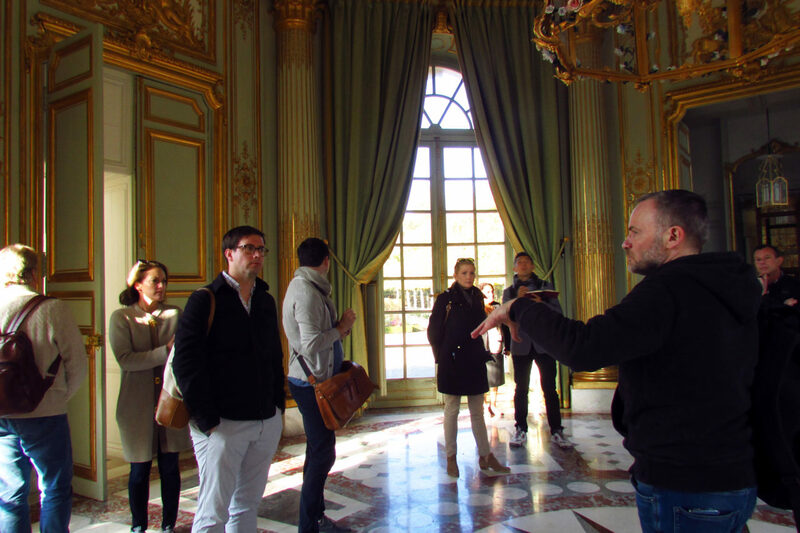 Under the direction of instructors Andrew Zega and Bernd Dams, we learned of the vast history of the Petit Trianon château and its pleasure pavilions. 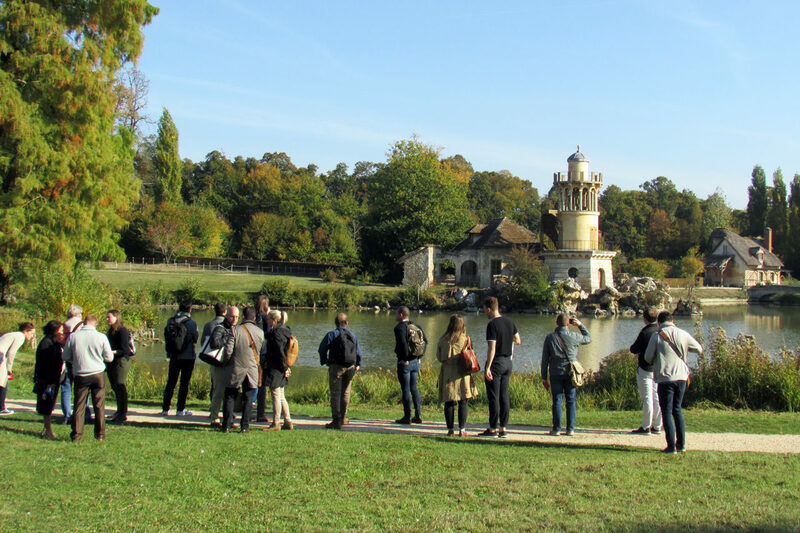 We took a tour through the grounds which included stops at the Pavillion Français, the Belvedere, Temple de l’Amour, the Queen’s Theater, and the Queen’s Hamlet, a rustic retreat for Marie Antoinette and her closest friends. 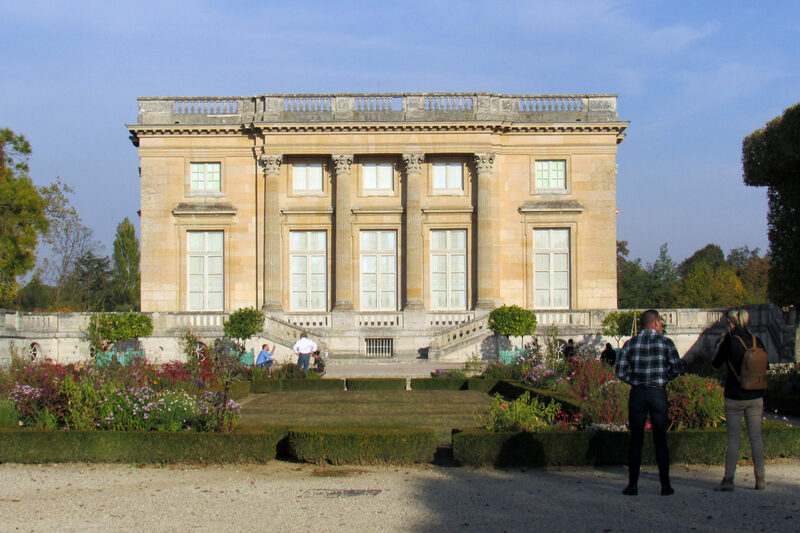 We then returned to the Petit Trianon for a private tour of Marie Antoinette’s living chambers and gardens. 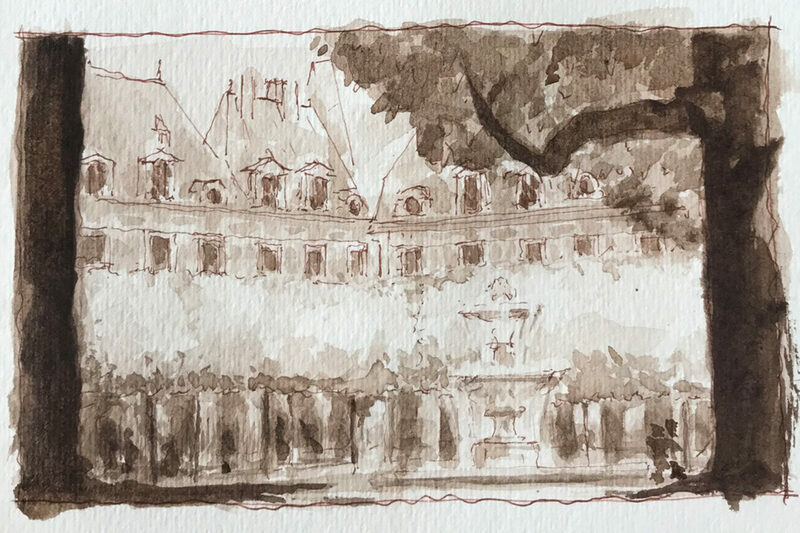 After learning and practicing the methods of plein air rendering in monochrome as perfected by Hubert Robert, we proceeded to employ those same methods in rendering the Petit Trianon. 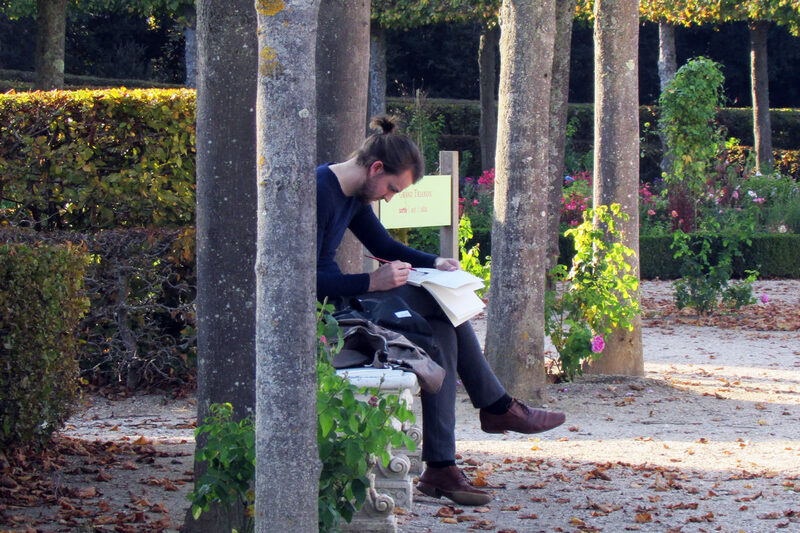 We also analyzed the composition of the gardens that frame the Petit Trianon. 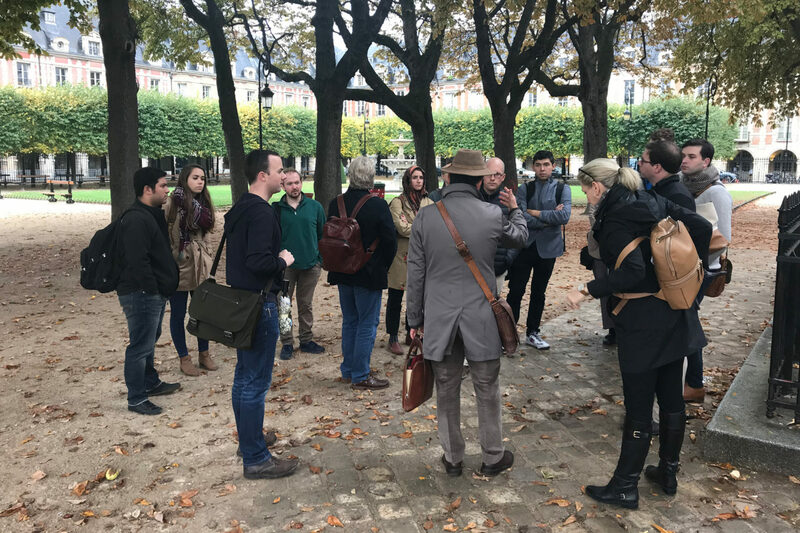 Instructor Kahlil Hamady described the relationships between the forms of French high classicism (in this case the design by Anges-Jacques Gabriel) and the surrounding gardens and landscape, so we were able to establish a proper documentation of the design at Trianon. Our day concluded with a walk back to the gates of the Grand Trianon after taking a quick peek at the Grand Canal of Versailles. Today was the second day of the Christopher H. Browne Paris Drawing Tour, which we spent working in the studio of Andrew Zega and Bernd Dams. We began the day with a presentation by Andrew and Bernd on how they create an architectural rendering. Before Andrew and Bernd begin any project, they first do deep historical research. Next, Bernd measures their subject and then meticulously drafts the elevations. For those who wonder what I mean by meticulous drafting - Bernd counts every shingle on the building! After the line work is done, Andrew renders the drawing to completion. His sensibilities with watercolor are incredible. During his presentation, he showed us the variety of buildings and materials he has had to capture. After lunch it was our turn to lay down some washes. Andrew showed us multiple techniques such as creating a flat wash, painting wet onto wet, and using a dry brush. We also learned how to perfectly mask our drawings with drafting tape and a utility knife. After our day in the studio we went to Atelier Rinck, an interior architecture and design company, for hors d'oeuvres, cocktails, and a tour. Valentin Goux lead the tour and showed us the company’s work and range of design capabilities, from high French baroque to 1950s modern. 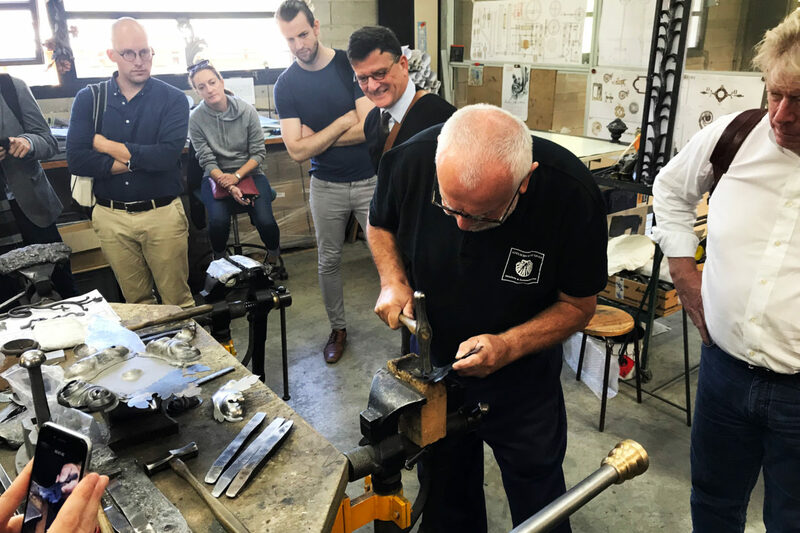 It was evident from the showroom that Rinck's level of craftsmanship is very high and we all left pleased to know that such superb craftsmen and designers are still working today. 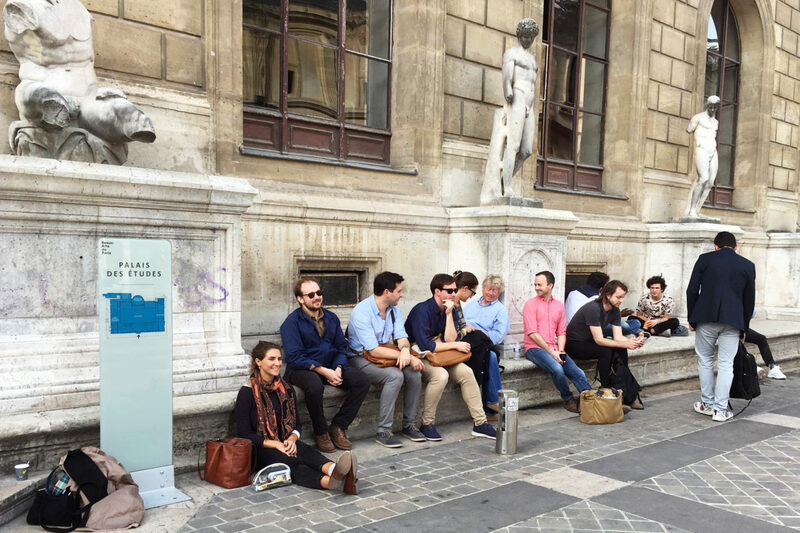 Eager and full of anticipation, the 2018 Christopher H. Browne Paris Drawing Tour participants and instructors gathered at L’Hôtel Turenne Le Marais to commence what turned out to be a captivating first day of study together. 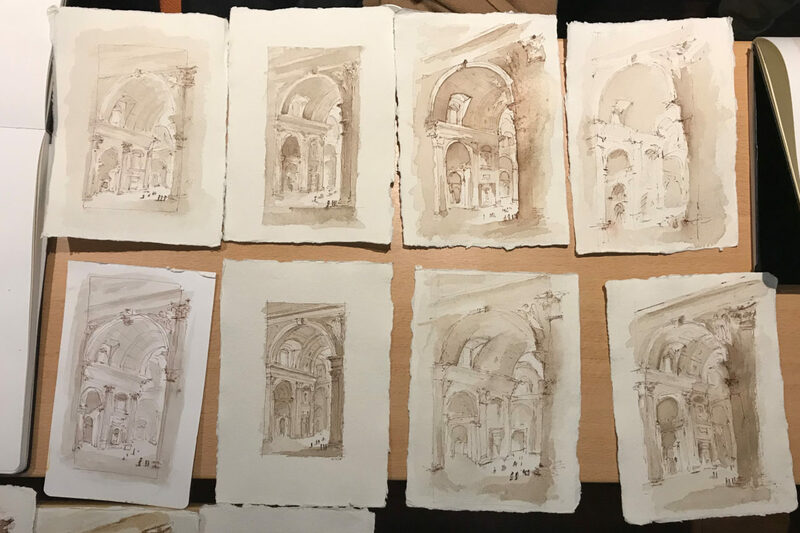 Instructor Kahlil Hamady of Hamady Architects awoke our senses and set out to loosen our hands as he led our morning exercises in the method of Hubert Robert. Emphasis was placed on the effective depth that can be achieved by the layering of watercolor washes. We began by gesturally capturing a given scene on our pages with ink fountain pens and over a series of four to five passes we built up our washes, increasing our pigment as we went. As we waited for each additional wash to dry, we had time to determine where the next layer of tone would best be placed, and utilized the remaining time to work on yet another sketch simultaneously. In succession, we made multiple attempts at the first composition; following those études we graduated to a longer, more detailed, and more challenging scene. Our morning came to a close as we encircled our drawings for review and discussed Hubert Robert’s approach to sketching. 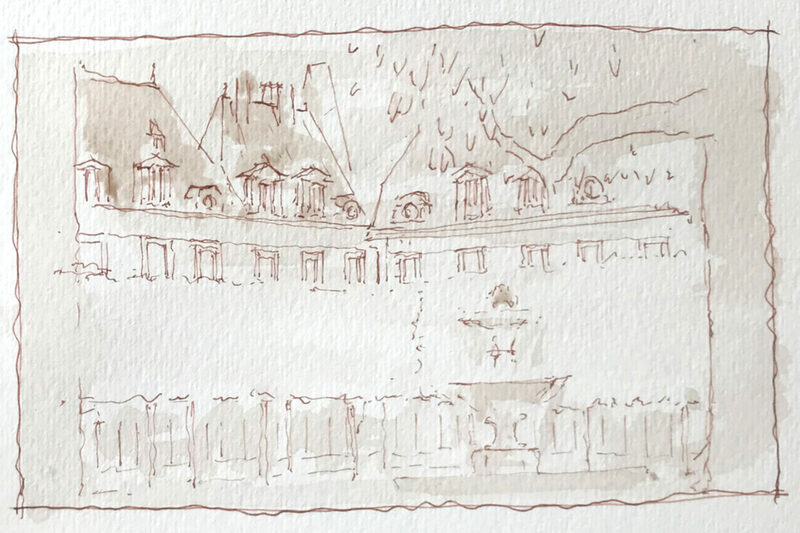 The moment the soles of our shoes touched the glistening streets in the afternoon, the rain eased and by the time we reached Place Des Vosges it has dissipated entirely. Encased by the oldest square in Paris, we each set off in search of different views in which we could apply our new sketching techniques. At surrounding bistros we shared ideas and sketches for what would become the day’s final illustrative drawing. We then hurried back to the square and each returned to our decided perches. 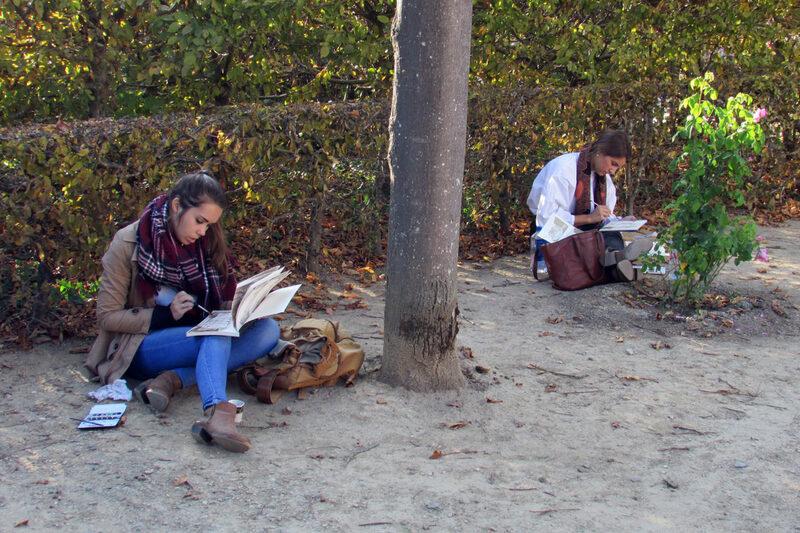 Scattered among the linden trees, we sketched and painted, and it was lovely. Once again we gathered with completed drawings in hand as we discussed our efforts and reviewed the outcomes. 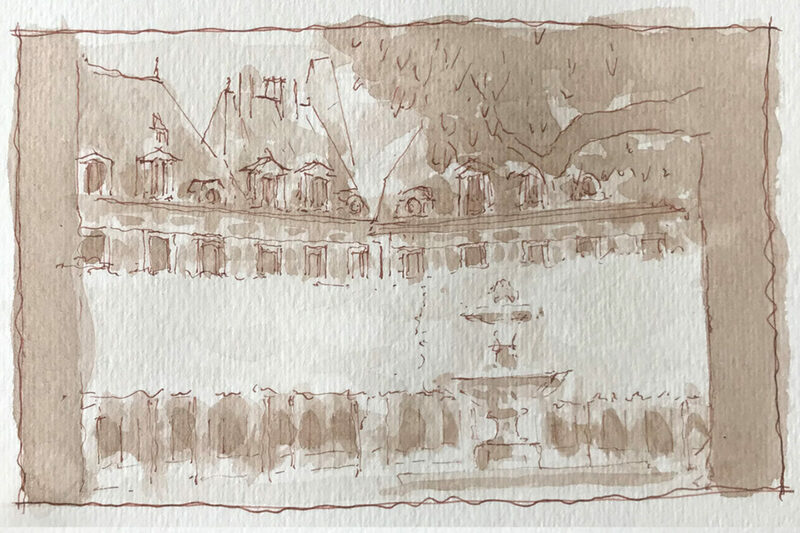 We could not, however, leave before taking the critical field measurements, for the beauty and intimacy of Place Des Vosges can truly be accredited to the relationship between the architecture and the landscape design. The scale of the manicured linden groves softens, highlights, and frames the surrounding architecture and makes for a well-beloved destination. 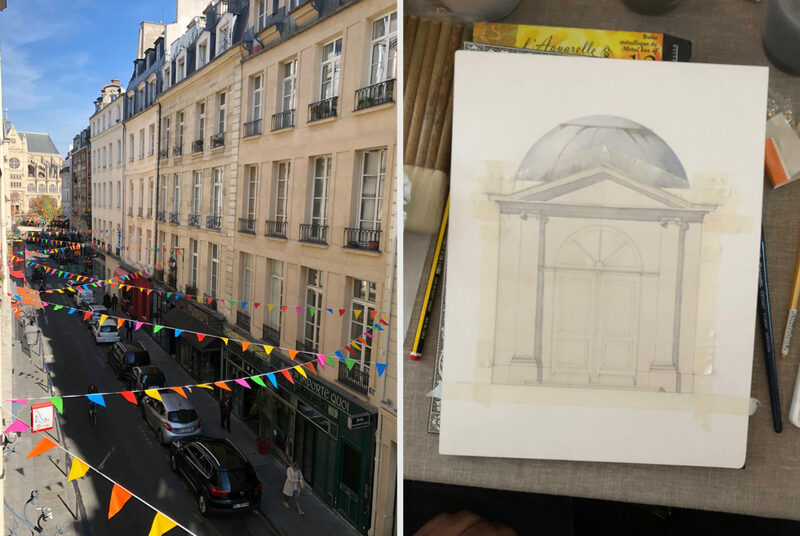 This Saturday, we kicked off the 2018 Christopher H. Browne Paris Drawing Tour. This year's group met in the heart of Paris, on the Rue du Roule, at the Studio of Andrew Zega and Bernd Dams. Surrounded by Andrew and Bernd’s brilliant watercolors, we were given an introduction to the grand tradition of architectural drawing and watercolor sketching techniques by our instructors Kahlil Hamady and Leslie-Jon Vickory. With great enthusiasm, we broke for hors d'oeuvres, champagne, and lively discussion to celebrate the start of our journey ahead. Sometime later we made our way down the Rue Saint-Honoré and cut over to the Palais du Louvre, where we were given the little-known history of the unorthodox origins of the Louvre and the legacy of Louis XIV by our knowledgeable guides. Shortly afterward, we arrived at Le Fumoir for cocktails followed by wine and a delicious three-course dinner. Our conversations were filled with excitement and anticipation for the exciting discoveries that lay in the week ahead.